Ennis to host national feminist festival in October – 400 gather in Danlann to celebrate, listen, reflect and dance! 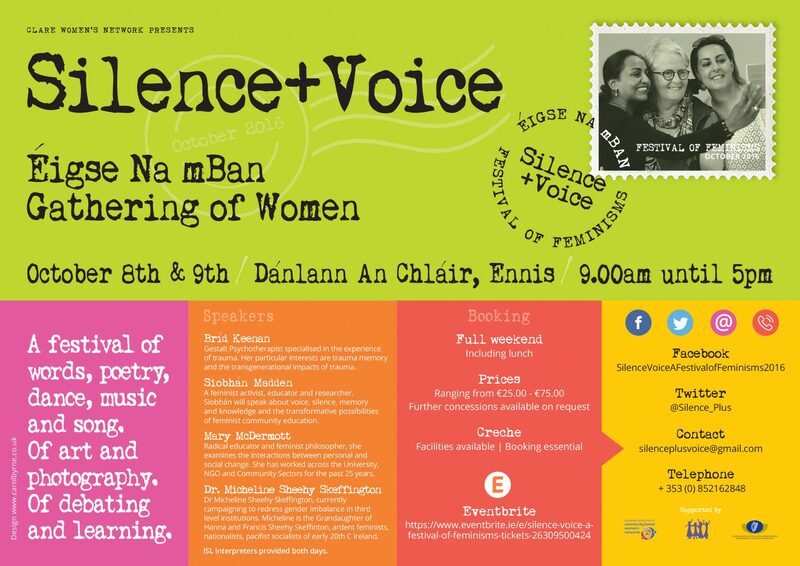 The Clare Women’s Network is delighted to present ‘Silence + Voice, A Festival of Feminisms’ in Danlann an Chlair, Ennis on the 8th and 9th of October. This unique event will offer 400 participants an opportunity to reflect creatively on silence and voice as part of their journey as women in Ireland. “It will be radical, it will be challenging, it will be exciting, but most of all it will be an engaging weekend” said Anne Rynne, Chairperson of the Clare Women’s Network. “The festival will be filled with debate and learning, music, song, drama, poetry and art. We see it as a positive and creative approach to the very serious problems facing women today in society and a space for conversations that are long overdue. Mary McDermott, Dublin, on gender equality in Ireland and possible ways forward. The speakers will be joined by local musicians, singers, poets and artists, with some dancing and acting thrown in for good measure! Tickets range from a very reasonable €25 – €75 for the two days, concessions are available on request, light lunch included. Crèche facilities must be booked in advance. This is a festival open to anyone from any background, with an interest in the many issues affecting women which will arise over the course of the two days and all are welcome. Come and support women – in silence + voice.